I have a calla lily in a pot. This is the 2nd year for it and is doing outstanding. It has had over a dozen blooms so far this season. Problem is, the blooms started out to be yellow but now stay green. Everything looks great. Leaves are beautiful, nice green and the blooms are big and strong, just no color. 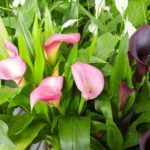 Your Calla Lily needs more sunlight.